Scratch removal is by far the biggest and most popular process that we are asked to perform. The biggest question is can my scratch be repaired so that I can save my investment. The honest answer to this question is no better then a Maybe. Since there are so many different ways a lens can become scratched its only after we make an attempt to repair will we be able to tell you that we can do it. The process that we engineered requires the use of filler chemicals and Quality Polishing Compound work to solve your lens scratch needs. 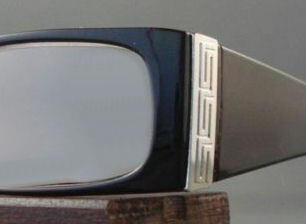 Eyeglass lens restoration is a lucrative business, trust only the best to do your job right. Please understand that our success rate for recovery is 50% that your lens will be saved, the ultimate solution to scratched lenses may be to do a lense replacement. Once your item is evaluated and all attempts to effectively save your lens have failed, you will be notified via email on the next steps. 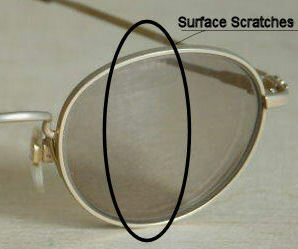 Some examples of scratched lenses that we succeed in repairing. This pair of Prada Sunglasses came to us with 2 distinct scratches. The 1st scratch was a 1/4 inch line and the 2nd was a 1/16th inch dot scratch. 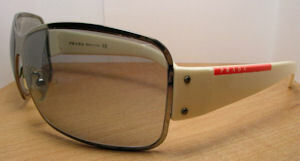 The lenses where brought back to marvelous condition. The lab performed a scratch repair and repaired the area in both places. 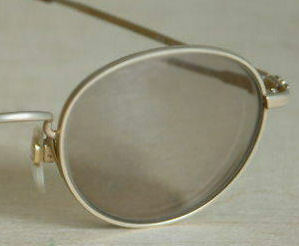 The lab saved this customer a lot of money to replace this frame as shield lenses cannot be replaced. The entire frame would have had to be replaced. 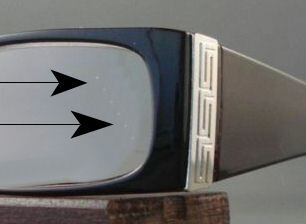 The customer dropped his Vogue Eyeglasses on the concrete steps. The concrete left tiny pebble marks on his progressive lenses that cost him about $500. This would have been a total loss for the customer had our lab not filled and buffed the lenses to take out the scratches to near perfection. Overtime surface scratches can develop even if you have scratch resistant coating applied to your lens. The buffing process works in some cases to remove the scratches or at least to make them appear much lighter and invisible. 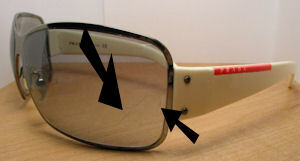 In this example, this pair of Armani exchange eyeglasses contained such a problem. You look at the results and judge.